Mardi Gras literally means “Fat Tuesday” in French. The idea behind Mardi Gras celebrations is that people overindulge before giving up something for Lent, which begins the following day with Ash Wednesday. This year Fat Tuesday falls on Tuesday, March 5, 2019. To make the celebration a little sweeter, we decided to gather up a few New Orleans inspired desserts, offered at local restaurants in Des Moines, that are just what you need to get in the spirit of Fat Tuesday! A traditional New Orleans dessert, bananas are sautéed in butter and sugar and cinnamon and then bathed in rum, which is set aflame in a fiery burst. Locally, you can find this decadent dessert at Buzzard Billy’s. It’s a no brainer that Bananas Foster should be on the menu at this Cajun Creole inspired restaurant. Your server will bring your dish still flaming to the table and served over ice cream. According to the Cafe du Monde website, New Orleans beignets are square pieces of dough that are deep fried and topped with powdered sugar. Bubba Southern Comforts serves Mulberry Street Beignets on their Brunch Menu, which are covered in powdered sugar and served with cracked caramel sauce. (I also highly recommend their Bourbon Bananas Foster and Whiskey Pecan Pie;). Mardi Gras is always a good time to break out the bourbon! You can enjoy the “spirit” of the Big Easy with the indulgent Chocolate Bread Pudding, made with a bourbon créme anglaise, at Louie’s Wine Dive. This local wine bar also serves “Beignets for a Cause” with a portion of their proceeds benefitting local children’s hospitals. Mardi Gras and King Cakes go hand in hand. Buried inside the batter of the cake is a tiny, plastic baby figurine. 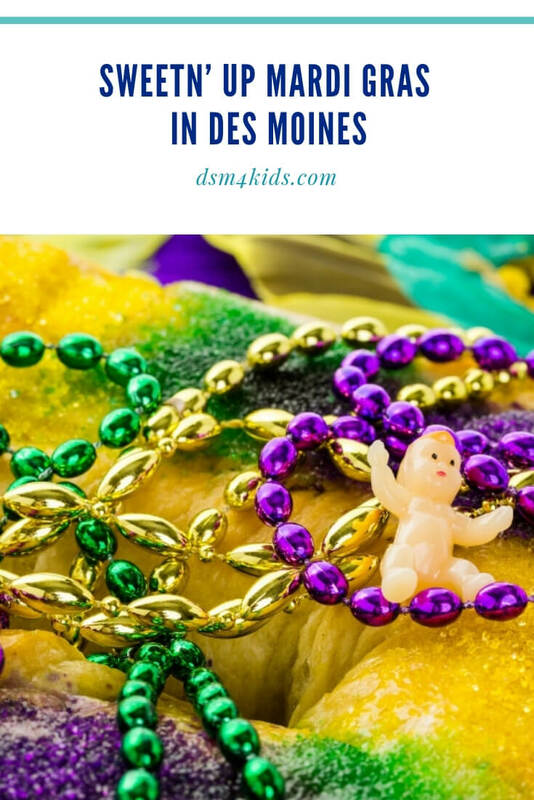 The lucky individual who scores the piece of King Cake with the baby inside is said to gain favor, and they’re also on the hook to host next year’s Mardi Gras party! The Bake Shoppe in Windsor Heights will bake up this traditional Mardi Gras dessert for you on request. Pecans are truly a “taste of the south”. Savor one of New Orleans’ favorite flavors by treating yourself to a Vegan Pecan Bar at Crème Cupcake or a slice of Salted Caramel Pecan Pie from Gateway Market Café. Do you have a favorite New Orleans inspired dessert at a local restaurant in Des Moines? Give it a shout out!